Flights also available from other UK airports – London Gatwick, London Luton & London Stansted – click here for more information on available dates and prices. Awaken in your comfortable cabin, and make your way on deck for the first delicious breakfast; a mix of Turkish and traditional continental fare, with special dishes prepared each morning by the chef. An informal but important pre-sailing briefing is given by the captain and on-board guide. Formalities completed, your vessel makes her way out of the harbour into the blue Gokova Gulf, away from Bodrum’s low-rise, whitewashed buildings, heading gently towards a first anchorage, in idyllic Alakisla Inlet. As every day, today there will be time to enjoy the warm sunshine and an opportunity for a swim or snorkel, a light lunch will be served with the ship at anchor. After a chance, to step ashore to wander through the ruins of a Byzantine village, and to enjoy afternoon tea and cake aboard, your ship makes her way in the early evening sun to the picturesque fishing village of Cokertme, where dinner is served. Step ashore, or simply enjoy a social hour or two under the stars aboard your gulet home. Enjoy an early morning dip before a breakfast cruise across the Gokova Gulf to the beautiful fishing port of Karacasogut, in its forested setting. 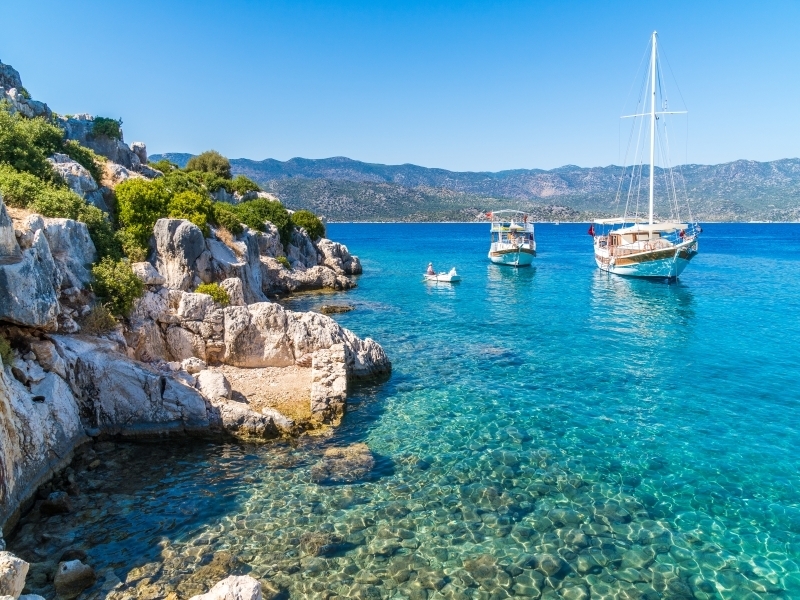 While your crew replenishes the gulet’s supplies, you can step ashore to explore, or perhaps to join an excursion to bustling Mamaris, one of the Turkish Aegean’s most famous resorts. Alternatively, take the optional excursion (payable locally) by jeep to the little town of Dalyan, famed for nearby Iztuzu Beach, a refuge for the protected caretta caretta sea turtles, which lay their eggs in its soft sand. However you spend your enjoyable day, you’ll return to Karacasogut and dine on board this evening. Bid farewell to your crew and fellow passengers and transfer to the airport and the return flight, at the end of a wonderful cruise.